Our faux fur seat covers are just plain fabulous and will definitely turn heads where ever you go! This is not a printed fabric, this is a real fur texture, luxuriously soft, sinful really, and with a very hip, retro feel. Behave yourself! 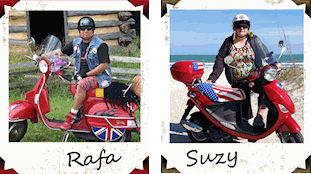 This is a fun and easy way to personalize your scooter, and as you can see, we have many options for you to choose from! While a faux fur seat cover is not waterproof, it does offer some water resistance in a rain shower, keeps your seat MUCH cooler in the sun and provides UV protection for your seat. Since our seat covers are easy to remove and put on, you can quickly remove the cover and store it in your pet carrier/trunk at any time. Machine washable too!